Through relevant teaching and energetic praise and worship, we gather together on Sunday mornings to celebrate God and be inspired and encouraged to live a missional life. Worship moves through singing, prayer, fellowship and teaching—altogether bringing us LIFE! We offer two identical services on Sunday mornings at 9:00 & 10:45 am. Nursery and Kids Alive (birth–5th grade) are available during both services. Show up early to get a good seat and a cup of coffee. We understand it can be a little overwhelming when visiting a church for the first time, and we want you to feel as comfortable here as possible. Listed below are just a few common questions we hear. If you have any additional questions please feel free to give us a call at the church office (616.457.5483) or stop by the Grow Wall in the Worship Center when you visit! You will find our main parking lot on the west side of our building but there are additional spots around the building. We also have parking available at Georgetown Chiropractic office, Jenison Public Schools International Academy, Bob's Butcher Block, the east side of Rebounderz, and the west side of Georgetown Tire. Please do not park in the strip mall north of Alive. 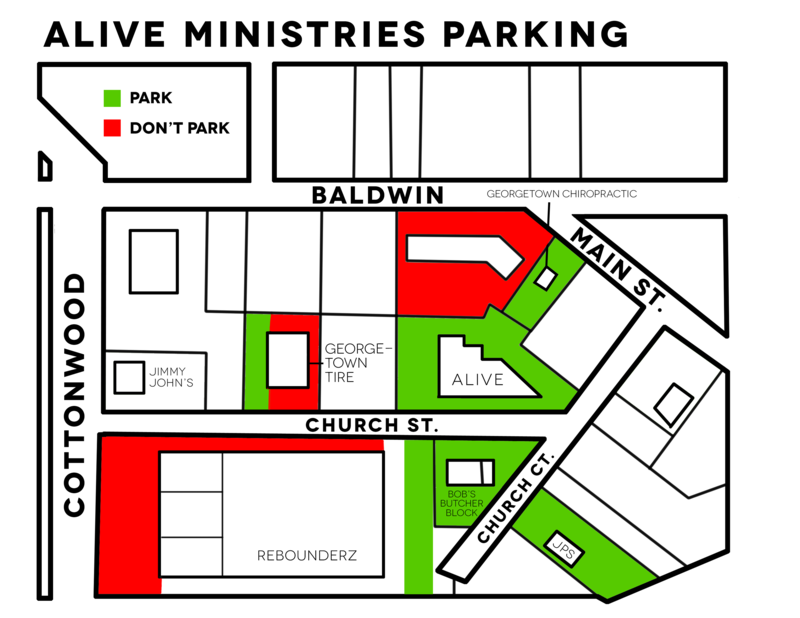 Click here for a detailed parking map. Worship services begin at 9 & 10:45 am and last about an hour and half. We encourage you to come 10 minutes early so you have time to get some coffee and bagels, check your kids in, and find a seat. After a time of singing and prayer, the children are dismissed to Kids Alive. Then it's half time! This is when you can get some more coffee, grab a bagel and say hi to those around you, all while hearing about the events and news at Alive. After half time there is a time of teaching from God's Word. We have Bibles available for you to use and take home if you would like one. You can also access the Bible on your tablet or phone during the message with our wifi. We are very casual and encourage you to come as you are and wear what makes you most comfortable. God doesn't care whether your attire is formal or casual; after all, he looks at the heart. So come as you are. Kids Alive is the perfect place for your children—infant through 5th grade—to attend while you are in the Worship Service. Check your children in before worship starts at the Check-In Desk. Infants (birth–3 years) may be dropped off in the nursery any time, but your older children (3 years–5th grade) stay with you through the beginning worship time and are dismissed prior to half time. Where do I go once I walk in the building? Whether you're trying to get to the Café, the Student Center, or the restrooms, we have directional signage to point you to the right place. If you're here for an event, the doors have large, highly visible letters to guide you to the correct entrance. We want you to feel welcome—because you belong here!  To listen to recorded teachings, click here. This series is about the truth that God wants you to experience—a breakthrough in whatever is enslaving you, tripping you up, or holding you back from knowing God the Father and His Son, Jesus. He wants you to have abundant LIFE; to know him, and live your life for him. That’s why he came here for you! So many things attack our relationship with God: our stresses and concerns, our struggles and failures, our pride and self-reliance. In those high-stress times, we often become prayer-less; we disconnect from God so we can tend to our trials. Prayer becomes our last resort, when it should really be our first option. This Lenten series is about intentionally (re)connecting with God—His way—so we can experience that breakthrough. The life of Jesus is our example of how to remain connected with The Father—to partner with Him, to know Him, to love him, and to prefer what he has purposed for our lives. Kids Corner: Listen now at kidscorner.net and subscribe to KC’s weekly emails for future episodes. Download KC’s Lent 2019 devotionals to lead your family’s bible study as you prepare for Easter. Family Faith Formation: Ash Wednesday Family Faith Formation Tip–Wearing ashes on one’s forehead on Ash Wednesday is a symbol of repentance. Talk with your kids about the fact that repentance is more than saying “I’m sorry”—it means asking God to change our heart and mind. For help with explaining what Lent means, check out tinyurl.com/LentQuestions and tinyurl.com/LentKids. Giving up something for Lent? Visit tinyurl.com/40ThingsLent for a thought-provoking list of 40 things (like worry and envy) that parents and older kids might consider giving up for Lent.